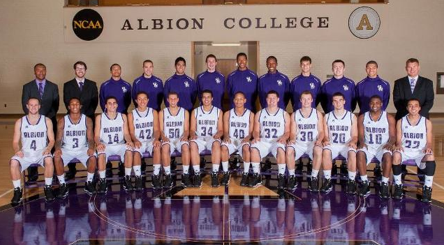 The Albion College Men’s basketball team kicks off their season on Saturday, Nov. 15, and the team’s upperclassmen are thrilled to start and make a name for themselves in the MIAA. After a (14-12) record last season, the Britons are looking to improve and qualify for the MIAA Tournament once again. The main focus for the Britons this off-season was the consistency aspect of their game. Last year they seemed to play to the level of their competition and stability in their game is something the team is looking to improve on. “Being consistent in games was a problem for us last year, and this year we are making sure that we aren’t taking any plays off in practice and games,” said Jordan Herron, Holt junior. The Britons aren’t exactly the biggest team in the MIAA, with the tallest player on their roster being 6-foot-7-inches. With that being said, the team has been hitting the weight room in the offseason, and has been trying to get bigger. Last year was the Britons’ best year record-wise since the 2010-2011 season, and this year’s captains look to build on that. “We have our goals set very high this year, and we expect to win the league championship and we truly believe we can,” said Zach Hurth, Lansing senior. The team won eight more games than the year before and if they don’t surpass fourteen wins this season, it would be a disappointment for the Britons and the fans. In order to accomplish that goal, the team has been focusing on their consistency, as mentioned earlier, and they need to have a deep bench with exceptional role players. The team has many incoming freshmen this year that could play key roles on the squad and could potentially see some playing time in big moments. The men’s basketball team has always been known for their friendship and brotherhood around campus, as they can often be found hanging out and having fun with each other. The team counts its brotherhood and team closeness as one of its greatest assets. “I feel that this year our team’s chemistry is great because we get along with one another and know how to encourage one another to give their best effort,” Oakes said. If the Britons continue to focus on their consistency, strength and team chemistry, this season should be a fun one to watch. As we saw last year, the men’s basketball team had great support at most of their games and the students were very energetic and loud, which caused away teams to struggle at times.